Global Warming of 1.5 °C is an IPCC special report on the impacts of global warming of 1.5 °C above pre-industrial levels and related global greenhouse gas emission pathways, in the context of strengthening the global response to the threat of climate change, sustainable development, and efforts to eradicate poverty. 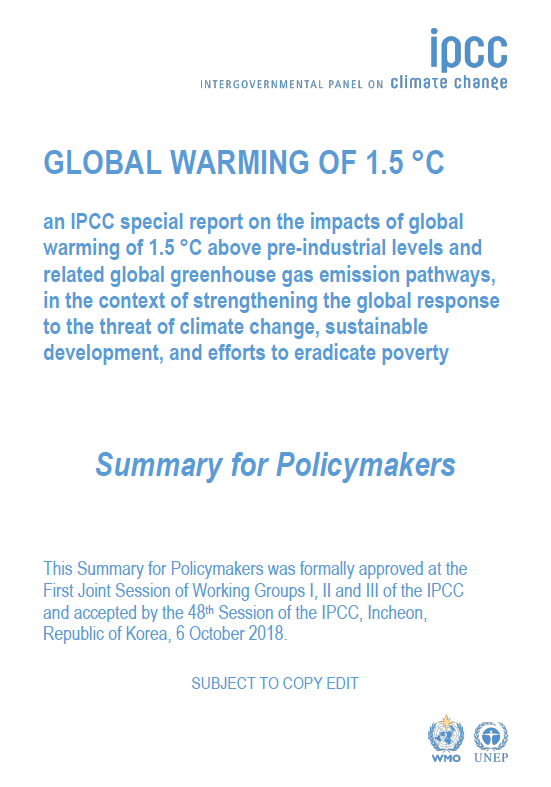 This summary for policymakers is based on the assessment of scientists and socio-economists, and is an effort to strengthen the global response to the threat "of climate change, sustainable development, and efforts to eradicate poverty." You can find the full summary for policymakers here. Social enterprises cut across different sectors such as agriculture, energy, water/sanitation, health, education and so on. The nature of their missions leads to operations in extremely challenging environments. Despite varied sectoral differences, these organizations work in a nascent arena balancing socio-commercial objectives and therefore experience similar obstacles that are well documented such as high operating costs, scarcity of trained human resources, constrained access to capital, dearth of processes that transition grassroots R&D to practical adoption, end user financing, illdefined standards of impact assessment, conflicting expectations of scale, stifling domestic policies and a host of other issues related to an underdeveloped ecosystem. This paper addresses one critical aspect of that ecosystemaccess to enterprise financing- and was borne out of a largely shared viewpoint by social enterprises that although there has been a widespread effort to capture the difficulties in accessing capital, there is limited insight into expectation gaps between the investment and practitioner community. While the impact investment market has enormous potential, there is a considerable amount of hype over the subject. The market is not ready to absorb commercial capital on the scale talked about and expected widespread profits and returns are probably some time away and in many cases will never be along the lines expected. As the average global temperature increases, the consequences of climate change are having the largest impact on the world’s poor. This is the population least responsible for greenhouse gas emissions driving global warming — and least able to cope with effects such as droughts, flooding, deforestation and other habitat loss, diminished agricultural crops, lack of access to potable water, diminished energy sources, and the spread of tropical diseases. The effects of climate change are already being felt in poor and developing regions of the world. In particular, poor women are likely to be most vulnerable to the effects of climate change: Their livelihoods rely more on natural resources threatened by climate change, and their ability to cope with the changes are hampered by social, economic, and political challenges. One promising response to the effects of climate change is to empower these populations to develop climate resilience. This report reflects a combination of on-the-ground experiences of China Impact Fund (CIF) and New Ventures China (NVC), and points of view from emerging impact investing practitioners active in mainland China. At Intellecap, we have always been fascinated by the power of entrepreneurship in driving social change. The passion and drive shown by numerous entrepreneurs working with the Base of the Pyramid is one of the most powerful forces to address the many challenges of access, affordability and livelihoods facing low-income communities in India. Our own tryst with narrating this entrepreneurial journey began with our first research series ‘Inverting the Pyramid’ from 2007, analyzing the rapid evolution of the microfinance sector in India. We were fortunate to have always been close to all the practitioners in the sector and the series was our effort to provide a robust commentary on the many highs and lows of this sector. Innovative financing is the manifestation of two important trends in international development: an increased focus on programs that deliver results and a desire to support collaboration between the public and private sector. This report aims to create a common understanding of innovative financing by providing an overview of the market and identifying opportunities for public and private sector actors to make innovative financing commitments. China’s open door policy has transformed the country’s economy, but at a social and environmental cost. Chinese Social and Environmental (SE) Small and Growing Businesses (SGBs) can help China face these challenges through economic development, poverty alleviation, and environmental benefits. Yet Chinese SE SGBs are limited by their lack of finance. Crowdfunding, soliciting small amounts of funding from many people primarily via the internet, provides an alternative to traditional forms of finance. Moreover, it can act as a form of impact investing when targeted towards Chinese SE SGBs, intentionally producing social and environmental (SE) benefits while also increasing the awareness and credibility of the nascent impact investing industry. Root Capital is excited to release our first multi-site impact study — Improving Rural Livelihoods: A Study of Four Guatemalan Coffee Cooperatives. As a complement to our ongoing social and environmental due diligence, this comprehensive study provides a more detailed picture of the impacts that our client enterprises have on the livelihoods of smallholder farmers and the environment. We also sought to answer the question: Does Root Capital’s financing and training enable our clients to increase their impacts, and if so, how and to what extent? How enterprises that reliably offer services — such as credit, training, technical assistance and the provision of inputs — to farmers can help them earn higher and more stable incomes. How cooperatives are helping members adopt more sustainable agricultural practices, although overall use of soil, water, and biodiversity conservation practices remains limited. How cooperatives are helping to level the playing field between households represented by female and male cooperative members. How Root Capital’s lending has allowed cooperatives to strengthen their relationships with farmers and pay them earlier in the harvest season. We also highlight areas for further research and implications for practitioners, including guidance on how to share findings and feedback with clients participating in such impact studies. The research was conducted in collaboration with the Multilateral Investment Fund of the Inter-American Development Bank and the Committee on Sustainability Assessment (COSA). The four cooperatives that participated reflected the range of our Guatemalan coffee portfolio in terms of geography, ethnicity, length of relationship with Root Capital, and diversity of sustainability certifications and buyer relationships. Find more info and download here: http://info.rootcapital.org/guatemalan-coffee-study.